A young team on the National Hockey League (NHL), the Washington Capitals are a hockey team based in Washington D.C. They are members of the Metropolitan Division of the Eastern Conference of the NHL. Their home ice is the Capital One Arena and they’re coached by Todd Reirden. Let’s take a look at the Washington Capital’s record and history in the NHL. Founded in 1974 as an expansions franchise along with the Kansas City Scouts, it was owned by Abe Pollin. This makes the Capitals a relatively new team in the NHL, considering that some teams – like the Boston Bruins – were established in 1924. During their first inaugural season, the Washington Capitals performed poorly. This could be because there were few players with professional experience on the team, which put them at a severe disadvantage. They set records for the most road losses, most consecutive road losses, and most consecutive losses in general. The Washington Capitals wear the all-American red, white, and blue colors. Their mascot is called Slapshot, who is a bald eagle with a red jersey and blue shorts. After decades of really bad performance, the much later Capitals team managed to garner some wins. They won the Prince of Wales Trophy twice in 1997 and 2017. Also, they won the Presidents’ trophy in 2009, 2015, and 2016. Finally, they’ve managed to win the Stanley cup in 2017. Individual players in the team have also received some awards. Their most successful player, Alexander Ovechkin, has racked up a number of trophies with the Washington Capitals’ jersey on. He was the first captain to lead the Capitals to Stanley Cup victory. Some of these awards Ovechkin has won include the Conn Smythe Trophy, Art Ross Trophy, Calder Memorial Trophy, and the All-Rookie Team award to mention a few. Alexander Ovechkin 2005-06 season was one of his best. He set the NHL rookie record for scored goals. It was the fourth-highest total in NHL history. 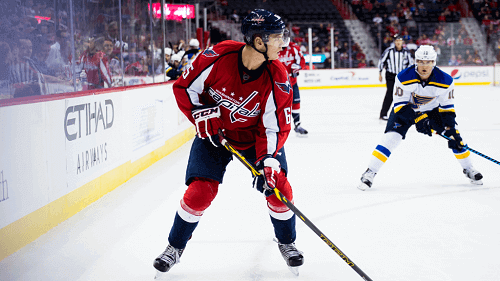 The Washington Capitals have become an NHL betting favorite over the years. Their legacy in the league may be a record of losses but, with an emerging squad of stellar players, it looks like the Capitals’ bad break is going to be a tale of rising from the ashes.